Dogwood Forest Dunwoody is a beautiful community settled in beautiful Metro Atlanta at the top of the perimeter off of Peachtree Dunwoody Road. The building is older but the exterior is well maintained and has a modern look. The interior of the building is slightly dated and could use a little remodeling to bring it to a modern feel. The residents were clean and pleasant but the staff lacked professionalism and when I entered the building no one was at the front desk to assist me with my needs. Leadership changes often in that community. The food resembled that of a nursing facility instead of a high end senior living community. The activities were mediocre and did not engage many residents during my visit to the community. The hugest con for me was parking, there is a huge lack of parking in the front of the building with no additional packing to the rear of the building or any other location. If you live in the Sandy Spring/Roswell area and you are looking for convenience in location this community could be an option for you. I would suggest an individual be very involved in their loved one's care while they are at that community. The best way to get to know a community is by scheduling a tour. See the facilities, meet the staff and residents, and get a feel first hand what it's like to live at Dogwood Forest of Dunwoody Assisted Living. 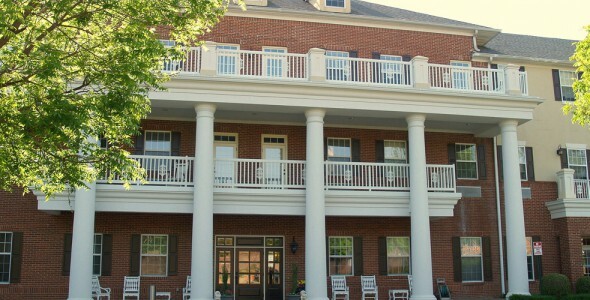 With an elegant country-home feel, stylish design and impressive array of amenities and services, Dogwood Forest of Dunwoody in Atlanta, Georgia offers seniors a comfortable assisted living community. Operated by Trinity Lifestyles Management, our community was built with intentional design for the specific purpose of creating positive outcomes for seniors. We understand that the special touches like stylish living accommodations, optimistic caregivers and access to nature are essential features of an environment where seniors will thrive. From the broad covered front porch with welcoming rocking chairs to the vibrant courtyard, fountain and garden, you'll find Dogwood Forest of Dunwoody is built for comfort. Our tastefully decorated interior features wide hallways - ensuring easy mobility - and cozy sitting areas on each floor. Common areas include a business center and meeting space, activity room with big-screen TV as well as a beauty salon and barber shop. You may choose from a number of spacious floor plans offering plenty of natural light, a private bathroom with a walk-in shower and an attractive kitchenette. Each apartment also includes an emergency call system, smoke detectors and an automated fire sprinkler system for your security. Ceiling fans, window treatments and wall-to-wall carpeting are also among the amenities you can expect. Dogwood Forest of Dunwoody partners with local medical centers, churches and schools to provide a comprehensive community environment with all the support services you could want. With staff available 24 hours a day and seven days a week, we are there to ensure your safety. Services such as in-house physical and occupational therapy can speed recovery from injuries and improve health of those with disabilities. Activities such as senior yoga also form part of a comprehensive wellness program. Those suffering from memory impairment conditions can benefit from our innovative “5 Sense Therapy” program, which works to engage those with Alzheimer's and dementia with the world, improving their awareness, concentration, memory and reducing stress. We welcome you to visit Dogwood Forest of Dunwoody and see how a better living environment can foster a better future.